Since the 4e appeared, a fast evolution of the field has occurred. 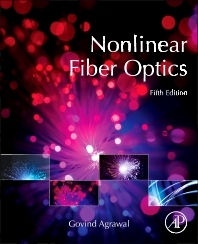 The 5e of this classic work provides an up-to-date account of the nonlinear phenomena occurring inside optical fibers, the basis of all our telecommunications infastructure as well as being used in the medical field. Reflecting the big developments in research, this new edition includes major new content: slow light effects, which offers a reduction in noise and power consumption and more ordered network traffic-stimulated Brillouin scattering; vectorial treatment of highly nonlinear fibers; and a brand new chapter on supercontinuum generation in optical fibers.